What do you do when your Big Man comes home with about 15 mammoth courgettes and you´re the only one in the house who really enjoys them? Well, you have to give a few away to a courgette loving neighbour, and then get creative. The courgette loving neighbour gave me a recipe for her courgette bread which looks delicious and rather like my Banana Bread recipe. As soon as I´ve made it I´ll let you know how it goes. Then I made some little courgette pancakes, but more of those another time. And then I thought it was time to tackle some pickled courgettes. These remind me of special Italian family meals when I was younger – lots of salamis and pickled vegetables as a big Antipasto. It´s been years since I made them, and I used mustard powder and turmeric which is not so Italian, I have to confess. I used a recipe I found on the BBC Good Food Website with a few small tweaks. Sprinkle the courgette slices with salt and then cover with ice cold water and leave for an hour. Drain and pat dry. Meanwhile put the rest of the ingredients into a saucepan and heat to dissolve the sugar and leave to bubble for a couple of minutes. While the pickling liquid is cooling down a little, pack the courgettes into two sterilised jars, pour the liquid over and seal tightly. The recipe says to keep them in the fridge and that they will keep chilled for a couple of months. I have them in the larder which is cool. They will taste great in a few days, but I had a few slices that wouldn´t fit into the jars which I covered with a drop of the pickling liquid and ate that evening…and they were delicious! Gee, I haven’t seen pickled zucchi … er… courgette in years. As I recall, they took to pickling quite well and tasted great. Thanks for the blast from the past! Hee hee!! I hadn´t eaten them for years either (my mum and godmother always used to make them though) and I thouhg it was time to try them again. What a great idea for zucchini. Now here’s hoping I have a good harvest next year! We didn´t have any luck with them this year..this was from my brother in law´s crop! Thank you – yet more “canning”! They do taste a little like gherkin – maybe the brine more than anything. Very easy to do! Great idea – this is one pickle I haven’t tried yet…Looks like it’ll have to wait until next year, as Irene killed most of the squash plants. One to look forward to! I don´t think they´ll keep beyond a couple of months (and I haven´t made enough to find out!) as I think they´ll go soggy but as it´s something you can buy (if you can´t grow) year round, I may make some more soon! And do simple and quick to do! What a good idea and they look great. In other years I’d have been keen to try it, but this year our courgettes haven’t done well for some reason. This reminds me of when I used to make giardiniera – pickled mixed vegetables for making winter salads….must try that again. People don´t seem to have had much luck generally this year with courgettes. Do check out Chgo John´s Giardiniera recipe here! Oh yummy – never had a pickled courgette before – fantastic! I absolutely love homemade pickled veggies and this looks great. Thank you and Happy Labour Day to you too! Great idea! Thanks!! We’re just beginning to haul in a bumper crop of zucchini and are already behind on eating them! Will do – I made it but forgot to take photos 😦 but I´ll make it again 🙂 It´s a sweet bread but I also have a savoury recipe with cheese so I must do both when I get a chance.! Your recipe sounds like a lovely idea and reminds me of what people call bread and butter pickles that are made with cucumbers…especially using turmeric. 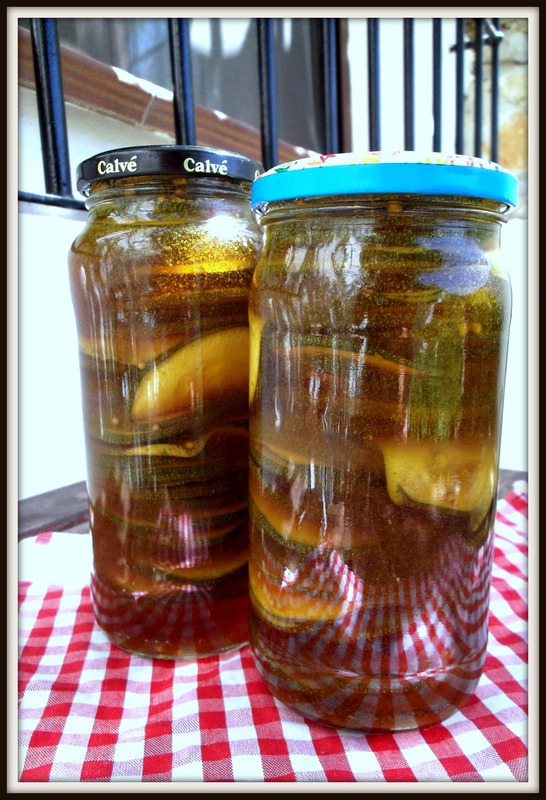 You´re right, Chgo John has a bread and butter pickles recipe which looks amazing. Great recipe Chica! In fact, it is an Italian tradition to pickle vegetables in vinegar (sottoaceti), and some in oil(sottoilio). I remember going to a friend in Calabria and her mother would pickle veggies and then served them with those delicious spicy Calabrian salami!! And it was a great idea to add turmeric and mustard seeds since both spices gives more flavor to zucchini!!! That´s exactly my memory – sottoaceti with ndjua (??) from Calabria! 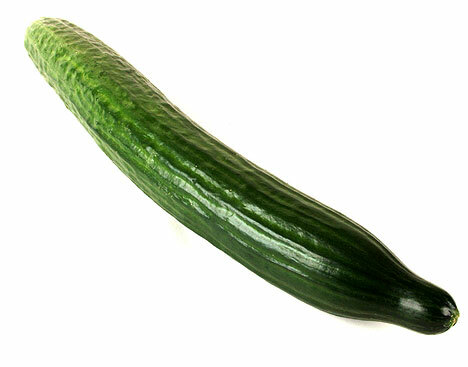 Is it possible to use those huuuge cucumbers (like this: http://img.dailymail.co.uk/i/pix/2007/08_03/cucumberDM2708_468x367.jpg) instead? I just don’t really like zucchini…also, could you use normal white vinegar instead? Ooh – those are what we call Dutch cucumbers – I don´t see why not. As they are more delicate than gherkins (like zucchini) I don´t know how long they would stay crunchy for but it would be worth an experiment. I think you could add in any spices as long as you also do the sugar/vinegar mix (although you could use less sugar)…peppercorns, dill, cinnamon, cardammon….anything that tickles your fancy! Am excited to know what you come up with. As to the vinegar, I think anything again would do. The recipe called for Malt Vinegar I think, I used white wine vinegar, my mum uses red wine vinegar…cider vinegar would be good too I think! Big Man really doesn´t like zucchini but he did eat quite a few of these pickles as he said that “didn´t taste all that much like courgettes”! Uni must come first – don´t work too hard! This looks great! I love any vegetable that has been pickled, so I will have to give this recipe a go. Thanks! Thank you – really quick and simple to do and very, very tasty! My pantry is quite big – a little room about the size of a small walk in wardrobe off the kitchen! I am very lucky to have it.